No matter how you look at it, a fishing excursion is always a good time. You get to spend time with nature, spend time with family and friends, and maybe even earn bragging rights over how large your last catch was. However, as fun as fishing at a local lake in your hometown can be, guided fishing tours make the experience even more memorable. When you use a guided fishing tour, you no longer have to worry about getting out on the water and endlessly checking over your list of supplies. On the fishing tour, someone else takes care of all of that for you. You can enjoy a stress free day where all you need to focus on is the fishing. The staff on fishing tours tend of have a lot of experience and can share with you’re the knowledge that they have acquired over the years, along with what they know about the specific area you’re touring in. There probably isn’t a question they haven’t heard yet, and they would love to share their information with you. Your guided fish tour will help you catch more fish. They know where the best locations are to fish. This way you’re not wasting away the whole day without catching anything! They know that if they don’t help people catch fish then they won’t be getting any business. 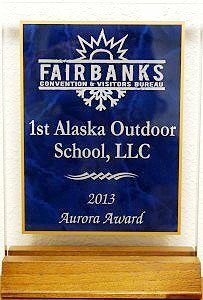 If you aren’t convinced just yet, give 1st Alaska Outdoor School a call and ask them your questions. They would love to hear from you and address anything that we might have left out here.